Halloween is my favorite time of the year and I love getting creative and making my own costumes. This year, I was pregnant with my first child and due on October 28, so I wasn’t sure if I would spend Halloween in the hospital or not. My daughter, Cadence, arrived a few days early, on October 24th and we were home from the hospital the next day. 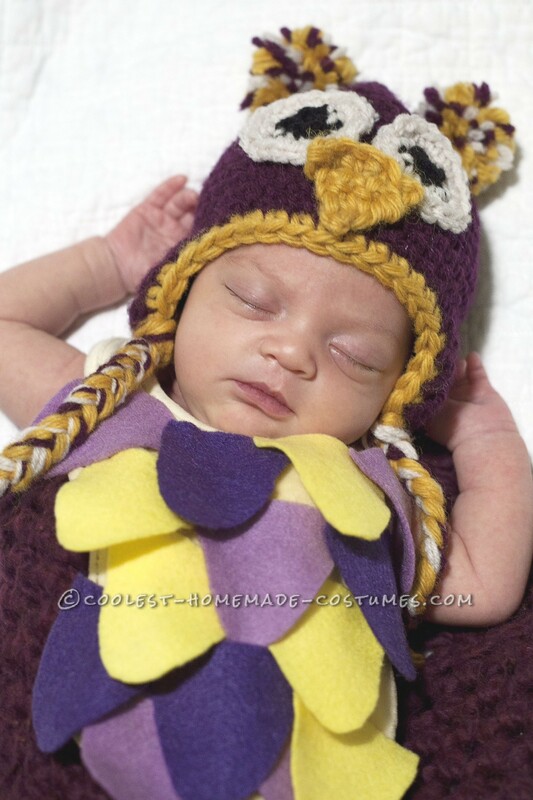 I decided to dress her up as a sleepy owl because I thought she would look adorable, and being only a week old, she sleeps a lot! I dressed myself up as a tree, wearing brown pants and a green shirt with real leaves attached to it. We were a perfect pair! In the evening, we handed out homemade goodie bags to the other children who live in our apartment building. All of the families knew that she had arrived, but they hadn’t met her yet. Everyone was extremely excited to meet her and they all loved her Owl costume! The kids all loved their homemade goodie bags too! Her costume was made entirely by me and all materials cost under $10. I crocheted her toque without following a pattern and added owl eyes and a beak on it. Then I sewed pieces of felt onto a bib to look like feathers. I made her costume in the few days leading up to Halloween while she was either nursing or sleeping on me, giving me her input! She’s a very peaceful sleeper, so it was easy for me to take a few adorable pictures of her all dressed up. Happy First Halloween!